This year, the National Gallery of Victoria brings focus to Pacific art and culture, with two major exhibitions of contemporary Pacific art, as well as a display of the NGV’s own collection, Art of the Pacific. This is of particular interest to me since I have a Samoan heritage. My Mum is originally from the village of Faa’ala on the island of Savai’i in Samoa, and holds a high chief title of ‘Papali’i Tele‘ from her Grandmother’s family, the Malietoa from the village of Sapapali’i. We have an extremely large, culturally rich family group on that side. In contrast, my Australian father grew up as an only child, with origins from Guernsey in the English Channel. Because I was born in Melbourne and grew up here, it has at times been a challenge to work out where I fit in to both worlds. These exhibitions will be both fascinating and invaluable to my life’s puzzle. 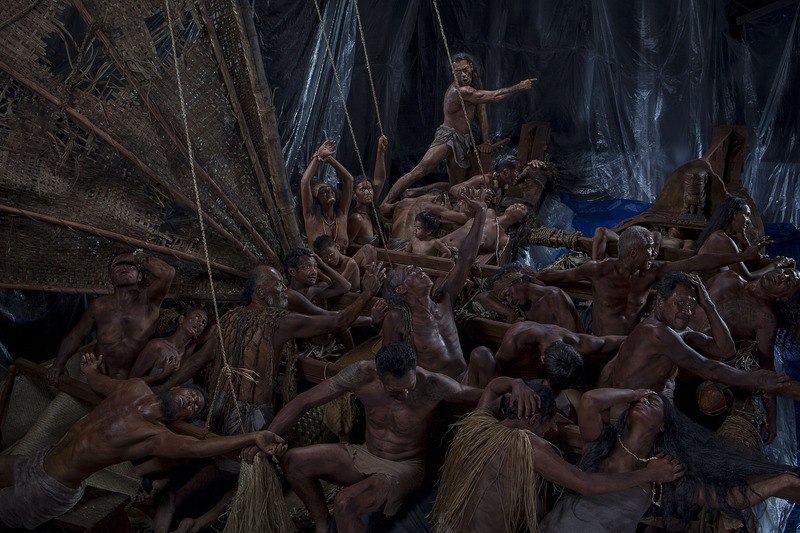 An exhibition of powerful photographic works that restages two iconic European history paintings with a cast of twenty-two indigenous actors from the Cook Islands. A live-action video work that restages the French neo-classical panoramic wallpaper Les Sauvages de la mer Pacifique (1804‒05). These major events will show alongside Art of the Pacific, an extensive collection display which honours the customary shields, figurative sculptures and masks, as well as a dynamic range of body ornaments, encompassing contemporary Polynesian lei, headdresses and jewellery, barkcloths and photographs of Samoan tatau. I look forward to sharing with you stories of the exhibitions and artists in the coming weeks. A celebration of Melbourne’s vibrant Pacific community offering an experience of contemporary Pacific culture and art with music, performances, workshops and talks led by international and local artists and curators. This special program marks the opening of Siu i Moana: Reaching Across the Ocean, Greg Semu: The Raft of the Tagata Pasifika (People of the Pacific), Lisa Reihana: in Pursuit of Venus and display of the NGV Collection, Art of the Pacific. Free entry. Venue: NGV International (on St Kilda Rd).